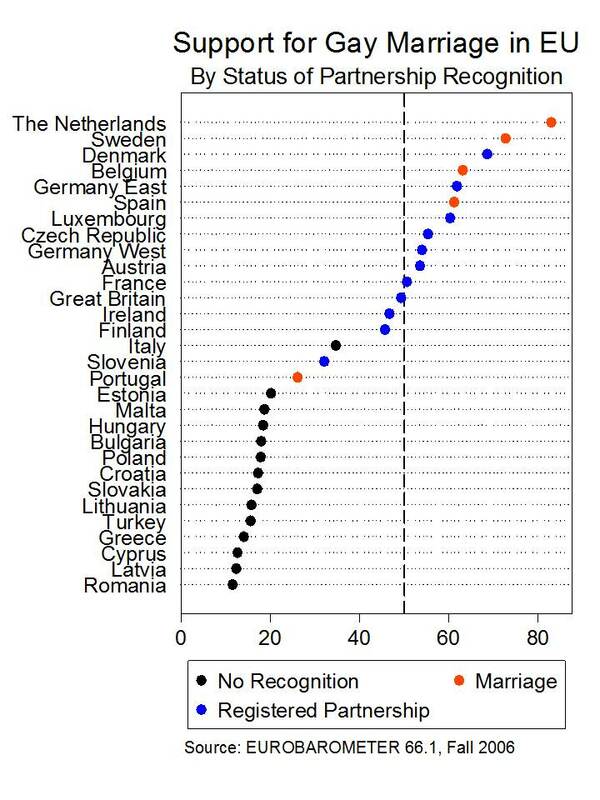 Gregory Lewis’ post on state public opinion towards gay marriage made me think it would be useful to provide some context from Europe. There is a perception that Europe is much more liberal on this score than the U.S. The truth is that even within European Union (EU) countries the variation is probably greater than within the U.S. A 2006 survey puts the range from 83% in the Netherlands (much higher than in Massachusetts) to 12% in Romania and Latvia (lower than in Mississippi). Mississippi is roughly where Greece and Turkey are (Turkey is included because it is a candidate EU member). Indeed, even the responses to President Obama’s announcement were as diverse in Europe as they were in the U.S.
As in the U.S. (pdf), public support for gay marriage and actual laws closely track each other, with the notable exception of Portugal (Data on partnership laws is from Kees Waaldijk). Unfortunately, I do not have more recent surveys that cover this wide a range of countries so I can’t say too much about change (see some evidence from individual country polls here). The oldest comparative poll stems from 1988 (ISSP), when the Netherlands led eight countries with 32% support, which is suggestive that quite a bit changed in less than two decades. The U.S. ranked lowest then with 11.7% support but none of the countries in the lowest half of the graph were included. None of this should really surprise anyone but it sometimes seems a bit forgotten that this is a very divisive issue in many places. Yes, these are all sovereign states but they are also bound by common European institutions that could start playing a big role. The European Court of Human Rights recently rejected a claim that gay marriage is a right protected by the Convention. But, as research I have done with Larry Helfer finds, the Court has in the past initially rejected a more interventionist role on LGBT rights only to reverse course when at least half of Council of Europe members had adopted a specific right. Moreover, we found that such judgments contributed to policy change especially in countries with low public support for homosexuals. Such intervention by European institutions may well be more controversial this time around; not just because of the issue but also due to the declining popularity of European institutions.